An introductory guide to using Drupal in a library, aimed at librarian project managers — the book expects little experience with computer programming and focuses mostly on what can be accomplished through the administrative interface. Drupal in Libraries (Tech Set #14) is available for order via Amazon.com and the ALA Store. “This is a good addition to the shelves of any information manager interested in the future uses of technology.” — Philip Calvert, The Electronic Library , Vol. 30, No. 5. “The book is easy to read, and will be useful for anyone wishing to understand more about the way Drupal works. The more general material, on planning a CMS implementation, marketing the site, and monitoring use, will be useful in a broader context.” — Brenda Chawner, Library Review , Volume 62 Issue 4/5. “… Installation tasks are logically, sequentially and exhaustively covered–certainly in sufficient detail for a systems librarian or amateur with the aptitude to build, populate, test, commission, promote and measure the impact of the new website. This advice alone easily justifies the purchase price. The chapter on metrics is also excellent. …” — Ian McCallum, Australian Library Journal , Volume 62, Number 2, p. 163. 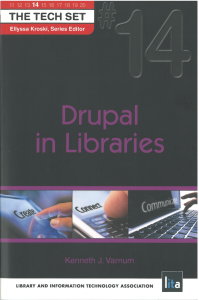 “Drupal in Libraries, the fourteenth in ALA’s Tech Set series, is an essential guide to any library contemplating a move to Drupal. … [It] is a primary guide for any library considering a switch to Drupal.” — Robert J. Vander Hart, Journal of Web Librarianship , Vol. 7, No. 3, pp. 349-350. Drupal is a free and open-source content management system (CMS) that many libraries use to create well-designed, easy-to-use and manage websites. Go step-by-step through the decisions and tasks needed to develop and launch a Drupal-powered site and learn the advantages of the open source approach. The book offers hints and suggestions to work with your IT department, colleagues, and management as you develop your technical specifications. The implementation chapter guides you through installing Drupal, adding modules, developing your own themes (page layouts), and describes librarian-created modules that have been shared with the community and can be downloaded and installed on anyone’s site. You also get advice on marketing your site, best practices for project management and development, and measuring the success and impact of the site once it launches.